Waterfall Canyon is the unofficial name of a short tributary of Red Rock Canyon, one of the largest drainages in the NCA, which starts in the forested slopes below Red Rock Summit, an outlying peak of the Spring Mountains, then heads northeast while staying quite enclosed for nearly 3 miles before widening, turning southeast and emerging from the red and white cliffs of the Sandstone Bluffs. 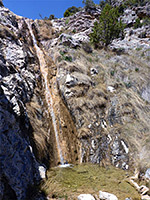 Although the main ravine is usually dry, Waterfall Canyon contains a stream for most of the year, flowing down steep slopes of light grey limestone, and this forms about a dozen significant waterfalls, the tallest 25 feet, plus numerous lesser cascades, between which are clear pools, up to 2 feet deep. The canyon is shallow, open and largely treeless, quite different to the deep, enclosed ravines through the Sandstone Bluffs (such as Icebox or Oak Creek), and it can be followed relatively easily. The falls extend over a distance of about half a mile, nearly to where the stream is formed, by a group of seeps and little springs, above which the surroundings are partly wooded, and the ground soon slopes up much more steeply towards the mountain crest. Faint paths run along one or both sides of the creek in places, though this is essentially a trailless hike, with a little scrambling necessary to pass some of the falls. The rocks are slippery, even when dry. 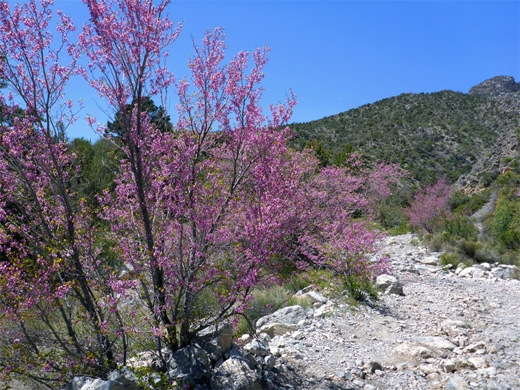 The canyon affords good views of the mountains and of Red Rock Canyon, and contains a small selection of interesting wildflowers including Nevada blue-eyed grass. 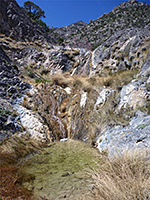 All the waterfalls are within the La Madre Mountain Wilderness Area. 17 views of Waterfall Canyon. 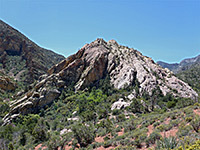 The usual start point for hikes to Waterfall Canyon is the Willow Spring picnic area at the mouth of Red Rock Canyon, at the end of a short spur off the one-way loop drive; a popular place that often fills up at busy times, when excess parking is available on verges a little way back. 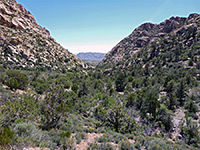 4WD vehicles can continue along the rough track (Rocky Gap Road) that heads further up the canyon, and meets the drainage containing the waterfalls after 1.7 miles. 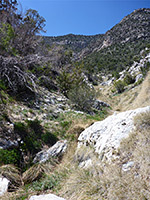 Nearly all people are here for the picnic area or the short walk to some nearby petroglyphs, and not so many hike upstream, and of those, most are heading to La Madre Spring (part of the White Rock Loop) rather than the waterfalls. Rocky Gap Road quickly becomes rough, its surface covered by large boulders and loose pebbles. 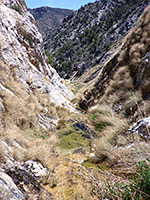 The track crosses from the north to the south side of the streambed, rising gently to the junction with the trail to La Madre Spring, and continuing with a similar uphill gradient as the drainage swings round to the southwest and enters a little gorge, bypassed by the road which is now running right along the boundary between the jagged Aztec sandstone that forms most of the cliffs of the NCA, here colored mostly white, and the grey limestone exposed all across the upper reaches of the Spring Mountains. The track climbs a little more steeply, winding across a few stony washes, up to a saddle, then traverses the slopes beyond, staying around 100 feet above the streambed. Along the way are a few park camp/areas on the south side, overlooking the valley. A prominent sandstone butte rises ahead, between the streambed and the road, which drops down slightly to the mouth of Waterfall Canyon, then ascends much more sharply via several switchbacks. 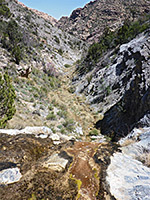 The stream from Waterfall Canyon often flows across the road, and causes the crossing point to be particularly rough, though in drier times the waters sink below ground higher up. A faint path follows the shallow canyon on the south side, past a few pools, to the first little waterfall, formed, like all the others, where the creek descends over a band of limestone, angled at about 45 degrees. The succeeding falls are gradually larger, up to 25 feet, tumbling into clear water pools, and often lined by colorful algae. A temporarily more level section is followed by the biggest fall and then some more smaller ones as the gradient steepens. Above the final major fall, the creek emerges through a narrow gap from a more enclosed, steep sided, V-shaped ravine that is harder to follow, but does not extend very far. The grassy ground at either side is quite boggy due to seeps. The stream fades away above this narrow section and the drainage is flatter, and soon becomes enclosed by pine trees, as it approaches a sheltered bowl at the foot of the mountain crest, the elevation now about 5,700 feet.